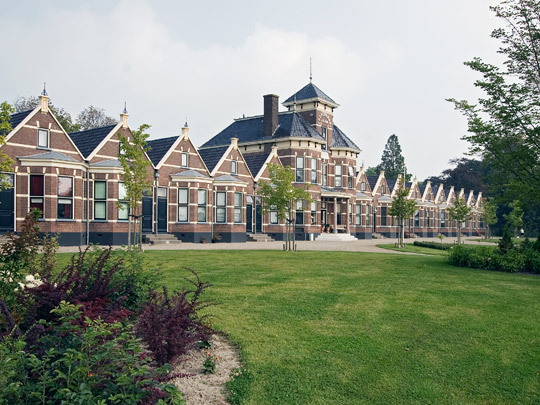 The Netherlands has a rich tradition of residential courts or 'hofjes', often established along philanthropic lines. A late example of this tradition is this group of 22 small dwellings for 'the elderly and infirm'. The ensemble was founded by the Akkrum-born tycoon Folkert Kuipers, who emigrated to the United States where he was naturalized as an American citizen under the name Frank Cooper. Coopersburg is a strikingly attractive residential complex with a front door, conservatory and gable for each home. The central section contains a trustees' room and a water storage tank serving a fountain in the promenade park behind the dwellings. A mausoleum for the founder of Coopersburg stands in the garden.